While we, at NYU Stern, understand the markets and institutions in developed economies to an extent, we need to do much more work to understand more fully the markets and institutions in emerging markets, such as India. Mumbai: The National Stock Exchange (NSE), India’s leading stock exchange, and New York University Stern School of Business (NYU Stern), one of the world’s premier research and teaching institutions, began their third annual ‘Indian Financial Markets Conference 2015’ today in Mumbai, India. This two-day conference is an outcome of the joint initiative by the NSE and NYU Stern to: (a) promote the study of Indian financial markets, (b) provide a platform for industry and academia to complement each other, and (c) deliver effective research support for policy making. The primary objective of this conference is to present and discuss the research papers which were selected on the basis of a global call for papers. On the second day, scholars and academics from leading global universities and institutions will present research papers on topics such as the impact of financial development on occupational choice, impact of derivatives on stock returns and effects of criminal politicians on firm value and investments, which are central to the development of the financial markets, particularly as they relate to India. "While we, at NYU Stern, understand the markets and institutions in developed economies to an extent, we need to do much more work to understand more fully the markets and institutions in emerging markets, such as India. The NSE-NYU Stern partnership provides a network of academics interested in studying the Indian financial markets," said Professor Viral Acharya of NYU Stern. New York University Stern School of Business, located in the heart of Greenwich Village, is one of the nation’s premier management education schools and research centers. NYU Stern offers a broad portfolio of academic programs at the graduate and undergraduate levels, all of them informed and enriched by the dynamism, energy and deep resources of one of the world’s business capitals. 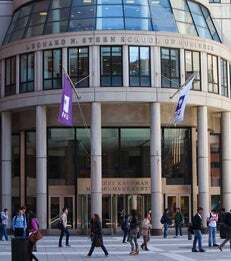 NYU Stern Salomon Center, founded in 1972, is a research institute that conducts theoretical and applied research in financial institutions, instruments and markets. Follow NYU Stern on Twitter: @NYUStern.